twister: That was a very creative senior prank! It was probably inspired by the old idea of wrapping cars in plastic wrap and that's only a step away from getting toilet paper tangled up in the branches of trees. There are so many amazing creative uses for common household products! 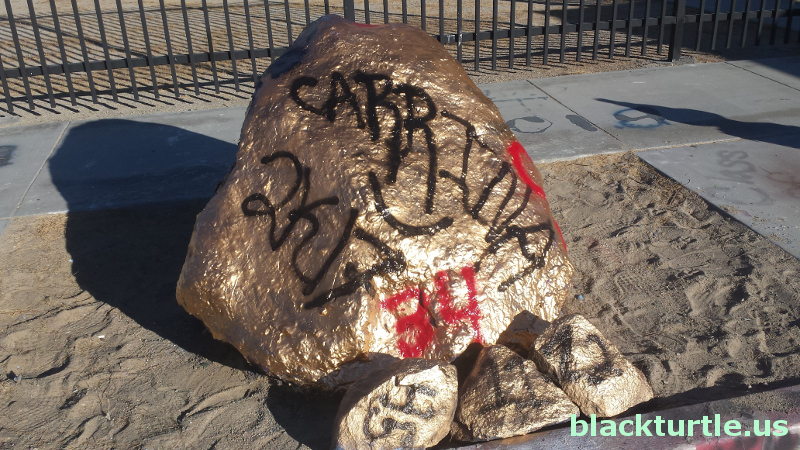 I noticed that the rock in front of the high school is decorated differently once again. It wasn't too impressive, but I'm pretty sure it was different. I don't recall if the fire hydrant was painted before or not, but for some reason it caught my eye too. tronagirl: Yes, I noticed the rock too. I'd give the class that decorated the rock an F minus and tell them to give it another try, only this time don't have the least artist moron in the class decorate the rock! I suppose it's fair to say that the creation of the China Lake military base pretty much wiped out the Darwin School District seeing as the only thing now between the actual town of Darwin and Homewood Canyon is China Lake! BTW, my understanding is that Darwin is now part of the school district in Lone Pine. Here's the design from late last week. It may have since changed. What I heard is that there was a design painted on the rock just before this that lasted maybe a couple of hours before this one was applied. ROCK DESIGN: The rock is supposed to celebrate an entire graduating class, not a single individual. On top of that 2K17 instead of 2017 is just asinine and the design is about as crappy as it gets. Hate to be a critic, but selfishness combined with lack of creativity equals total fail! dzrtdwg: The China Lake military base pretty much wiped out a lot of things. There's a lot of interesting history on that base. Although the base allows people to visit a few special spots, there's a ton of interesting sites that the public is never allowed to visit.